In an amazingly busy 2 days, all of the hard hat day places have been booked. For health and safety reasons our numbers are strictly limited and at this stage we don’t have plans to arrange further days, as to do so would risk delaying the completion of the project. The hard hat days are now over and the waiting list is closed. Thank you for your interest – please do check back to see further progress with the project. Hear more about our repairs project and climb the scaffold to meet the angels! Registration in advance through our website is essential as numbers are strictly limited. All we ask is that you take lots of pictures and leave a donation toward the project. 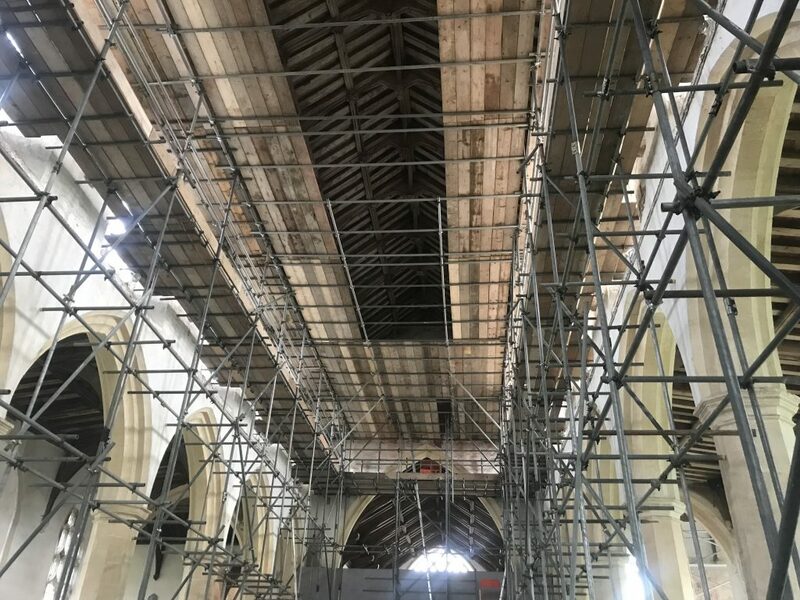 Those wishing to tour the scaffold will have to declare their fitness to do so; the ascent involves a number of long ladders, so please don’t sign up if you know you’re not fit for the climb. The contractor and the Churchwardens reserve the right to refuse access on the basis of their judgement and visitors will be required to sign a disclaimer after taking part in a Health & Safety induction provided by our contractor. To sign up for a hard hat day, click here and follow the instructions. Please visit https://aylshamparishchurch.org.uk/safeguarding for all details relating to safeguarding. Major rebuilding and repair works are underway in the church building. Whilst this is taking place the church building is closed until further notice. It is anticipated that the repair works will run from 7th January 2019 until around Easter 2019. This page, and our Facebook page, will be updated in due course. We are sorry for any inconvenience this may cause. Please feel free to contact us for more information. Visit Cawston Parish Church on our Facebook page. Join in the conversation on-line. Just click here to visit the site and don’t forget to like it too!